The Six-Party Talks and the P5+1: History Repeating Itself? Mark Twain once remarked that history doesn’t repeat itself, but it does rhyme. 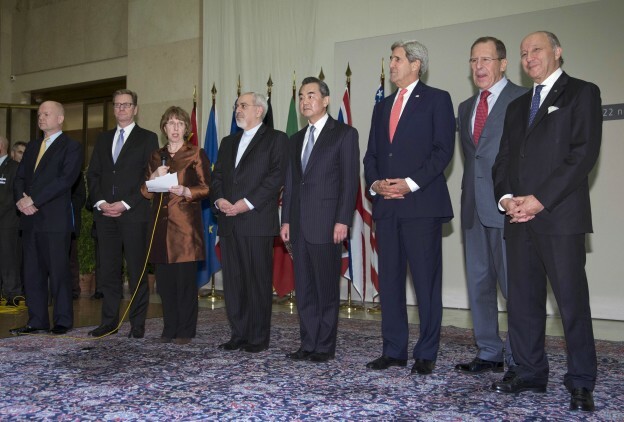 As Iran consummates the P5+1 Nuclear Agreement, one can hear the history of the Six-Party Talks rhyming in the air—with disturbing overtones. In the “other Six-Party Talks” (the P5+1), Iran has echoed the successful North Korean strategy of offering a “freeze for compensation,” publicly declaring elements of its nuclear program, forgoing further high enrichment, and allowing in international inspectors to non-military facilities. In return, Iran will receive the best of both worlds—substantial reduction of crippling economic and financial pressure that will be nearly impossible to reapply—retention of its key nuclear production facilities for “peaceful purposes,” plus an inherently complex, as yet undefined, but easily reversible process of verification that will be stretched over years. As with North Korea, monitoring of key military facilities and weaponization capabilities remains outside the scope of the interim agreement and will be left for further discussion. Most of Iran’s neighbors view the nuclear deal as a big victory for Iran’s hardliners who continue to tout it as a hard-fought victory of “revolutionary resistance.” The idea of resistance is at the heart of Iranian revolutionary thinking, and why denial, deception, and dissimulation are so pervasive in Iran’s strategic calculus. It is why Iran will flout international norms and violate agreements whenever necessary, because that is what resistance is all about—remaking the world in a new image, with Iran sitting atop a stronger Islamic community of nations. The Iranians and the North Koreans share a similar resistance framework. Despite determined diplomacy and global sanctions designed to curtail its ambitions, North Korea is winning its long cold war with the world. Nearly a year after last winter’s successful nuclear and intercontinental missile test cycle, North Korea continues to inch closer to attaining a position it has long sought—acceptance as a de facto global nuclear power with the ability to threaten and coerce the United States and our allies directly. Our diplomatic strategy of getting North Korea to abandon its nuclear program within the Six-Party Talks has proven an abject failure. Likewise, the UN sanctions-based pressure strategy has been ineffective at coercing a change in regime behavior or containing the North Korean proliferation threat. Pyongyang’s successful “nuclear resistance” has shown Tehran that a nation can succeed in clandestinely developing nuclear weapon—even in the midst of a diplomatic process where it overtly commits to cease such efforts, with few if any serious lingering consequences to regime stability. Moreover, the North Korea example shows that a nuclear resistance state can be rewarded by the United States and the other major powers—repeatedly—for its success, provided that it demonstrates some feigned willingness to turn back the clock and eventually denuclearize. It is time to stop the complacency on countering, containing, and disrupting North Korea’s proliferation machinery and malevolent regime before serious and enduring damage occurs to global security. A nuclear-armed and proliferating North Korea fundamentally jeopardizes international stability and US strategic interests in Asia and the Middle East, as well homeland security. Together with the ROK, US policy must squarely address the North Korean threat and seek to actively counter, protect, deter, and disrupt Pyongyang’s burgeoning nuclear and missile capabilities, especially the possibility of nuclear proliferation to Iran. Working closely with our South Korean ally, we need to organize and commence a global plan of action against Pyongyang’s proliferation apparatus, facilitators, partners, agents, proxies, and overseas presence. We also need a program of action, identifying and targeting the Kim regime’s financial lifelines, including its illicit sources of revenue. Finally, the United States should commence a program to influence the internal workings of the North Korean regime to undermine it. Although heavy sanctions are in place, they are obviously not sufficient. They are neither deterring the regime, nor interfering effectively in its WMD programs. “North Korea Inc,” though hobbled, remains functionally in the proliferation business. Via a network of nested trading relationships inside foreign partner countries (China especially), a litany of front companies, and the aggressive use of diplomatic “commercial sections” and “official” bank accounts (which are not sanctioned), North Korea’s WMD proliferation and illicit money making machinery continues to turn. We need a multiplexed campaign strategy to shut North Korean proliferation networks down, interfere with and sabotage its nuclear and missile programs, cut off leadership finances, hold the regime legally accountable for state-directed criminality and acts of terrorism and, ultimately, lay the grounds for a change in the regime if it does not change course. In essence, this was the mandate of the North Korean Illicit Activities Initiative (IAI) and the North Korean Activities Group at the National Security Council that I ran during the first term of the Bush Administration. The IAI involved over 14 US government agencies and 15 foreign government partners. Without the use of sanctions, we were able to use law enforcement, sensitive diplomacy, and other tools to strategically interfere with the Kim regime’s financial lifelines, culminating in the well-publicized designation of Banco Delta in Macao as a key leadership finance node and the indictment of key members of the regime in US Federal Court. The effect of the campaign of actions under the IAI froze North Korea out of key aspects of the international financial system and also produced destabilizing internal effects that could have been magnified as the ultimate tool of high-level coercive diplomacy to compel North Korea to abandon its nuclear program. 1. A great deal of mystery surrounds the Al-Kibar facility. Where did the financially strapped Assad regime get the money to build it? Was it a coincidence that according to a declassified US National Intelligence Estimate Iran in late 2003 put its nuclear weapons program on hold at roughly the same time that Iran’s ally, Syria, likely broke ground on Al-Kibar with North Korea’s help? Is it a further coincidence that North Korea simultaneously began constructing a weapons grade enriched uranium program, overseen by the same two officials publicly alleged to have been responsible for selling Syria its plutonium program? Did Iran somehow outsource its nuclear weapons program to Syria and North Korea in 2003? 2. James R. Clapper, “Statement for the Record Worldwide Threat Assessment of the US Intelligence Community,” US Senate Select Committee on Intelligence, January 29, 2014.